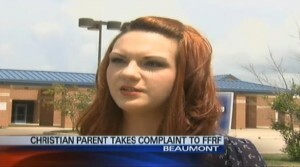 BEAUMONT — A school district in Texas is investigating a complaint after a mother who identifies as a Christian contacted a prominent atheist activist organization to express concerns over a prayer offered during a pre-k graduation ceremony. The Beaumont Independent School District has confirmed that it received a letter from the Freedom From Religion Foundation (FFRF), which claims that a prayer recently offered by a student during the event violates the United States Constitution. On May 31st, a pre-k teacher at Amelia Elementary School conducted a graduation ceremony for her class, and had a student begin the event with an invocation. “The little girl said something like, ‘Thank you God for this day. Bless us all. In Jesus’ name, Amen,” the teacher, who is not being identified, told local television station KBMT. However, one of the parents that was in the room, Amber Barnhill, later approached the teacher about the prayer, explaining that it had no place in a public school. She told reporters that she took offense at the teacher’s response. But the teacher says that she did apologize. “I expect acknowledgement and accountability, and assurance that this is not going to be something that continues,” she added. The teacher says that she will not have prayer at future events. As previously reported, FFRF also recently contacted school officials in Lindale, Texas after a parent complained about the explicitly religious content of a play being performed by approximately 60 5th graders from EJ Moss Intermediate School. After an edited version of the musical was performed, a local pastor rented space at the Lindale Performing Arts Center so that the production could be presented in full as originally planned. Over 2,000 area residents attended the event, which overflowed into the front yard of the Center.